Route description: Cross the road and locate a small trail that heads north, then northwest. There are several trails, the best route is likely to stay fairly high on the north-east side of the small knoll named Hatten (106m). Then descend to lake Klubbvatnet near its outlet where a wooden walkway has been constructed around some steep cliffs leading to a small bridge across the creek. Continue on meadows along the west side of Klubbvatnet, then across a new bridge where Klubbvatnet connects with Kristivatnet. The trail now climbs gently across a hill, then steeply (wooden stairway!) down to lake Bladtjørnet. Continue along the trail as it heads north, then northeast towards the south end of the fjord Sørfjorden. As you enter a large meadow near Sørfjorden, keep right and aim for the inlet called Tømmervika. Here, the cliffs on your right side are near vertical, however, a distinct ramp with vegetation connects from the bottom, traversing left to reach the top. Climb this ramp in order to reach easier terrain on the top. 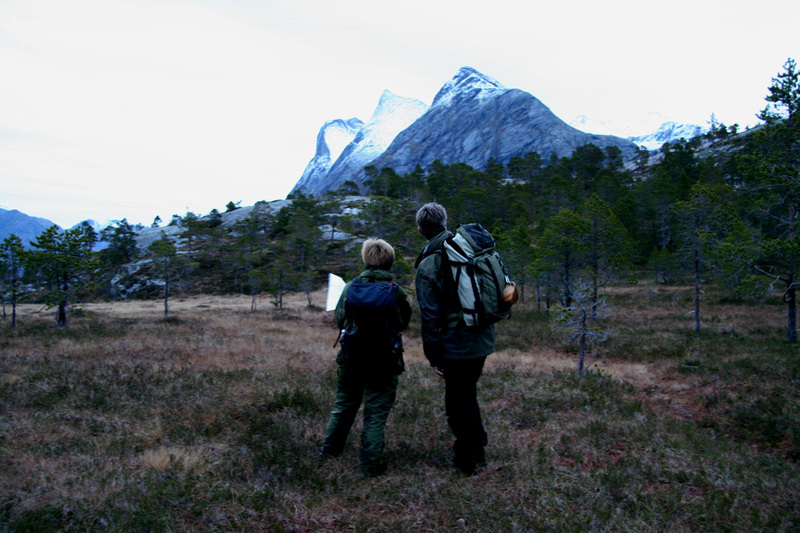 Continue east above Storvika until you locate a natural way to descend to the beach. Thus, after hiking for about 1.5 hours, the trail runs on the very beach among seaweeds, elevation 0 meter! Continue along the beach until it is blocked by new cliffs running straight into the sea. Climb east and enter the valley Storelvdalen, initially away from the river, but your route will bring you closer to this river higher up. You will notice a waterfall, the river is easily crossed about 50 meter below this fall. Continue up the valley, but now on the left (north) side of the river. This is a nice area with meadows, contour around left and connect with the river just where it comes steeply down a narrow canyon, a few big rocks slightly submerged, provide an easy crossing to the east side. 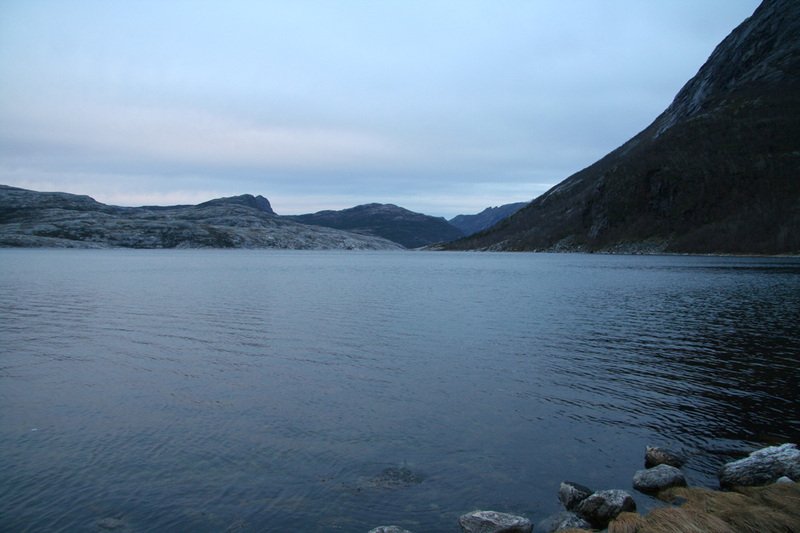 Climb along the river to lake Storejuvvatnet, elevation 335 meter. Your location is now N67:23.180, E014:54.967, and you have hiked about 8.5 kilometer. Continue along the north side of the lake, then easily up into Breidvikskardet, a nice saddle splitting the mountains in this area into two groups. There are some small ponds in the saddle, after passing the second of these, start climbing gently on your right side (to the east) while traversing left. The bowl above you is quite distinct, we found a good route up among boulders on the left side of the bowl (just below the steep ridge), then traversing right above the lower cliffs onto easier terrain. This route is never steep and quite easy. Continue upwards towards the broad saddle south of the summit, then climb more left and reach the main southwest ridge from Breidviktinden. The northwest side is very steep, but the ridge is wide and gentle on the opposite side. Follow this ridge the last few minutes to the summit cairn. This hike is about 25 kilometer roundtrip with about 1400 meter vertical gain, hikers should be well equipped and in reasonable shape. 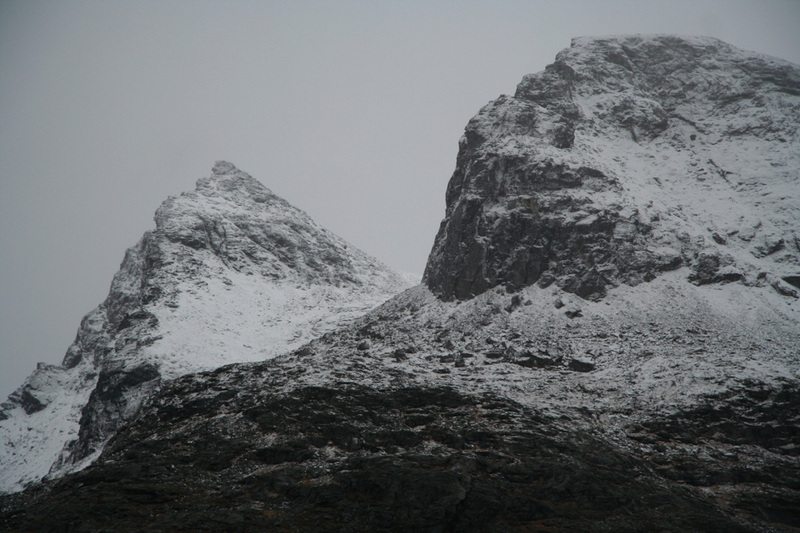 Comments: I did this hike together with Dag and Therese, we were all signed up for a ski climb of the big mountain Suliskongen (1908m) organized by the Bodø mountaineering group (BOT), however unseasonal mild weather melted all the snow and this trip was cancelled. I had already bought my (nonrefundable) plane tickets from Bergen to Bodø and decided that a couple of high prominence peaks in the area should do fine as a substitute. However, when the organizer asked me what I might prefer, I forgot that Breidviktinden (1154m) had its 1000 meter prominence "stolen" by Sjunkhatten (1185 m). A map I had used stated a lower elevation for Sjunkhatten. I therefore suggested Breidviktinden and added that I would do the easier Eidetinden (1020m) on Sunday before flying home. In order to have maximum flexibility I booked a rental car at the Bodø airport and learned about the ferry schedule to Kjerringøy, observing the fact that an early Sunday morning ferry would need to be prebooked before 2150 on Saturday. However, when talking to Dag on the phone it became clear that he wanted to join me for the Eidetinden climb in addition to Breidviktind. He had a car and it was agreed that I could cancel my rental car. 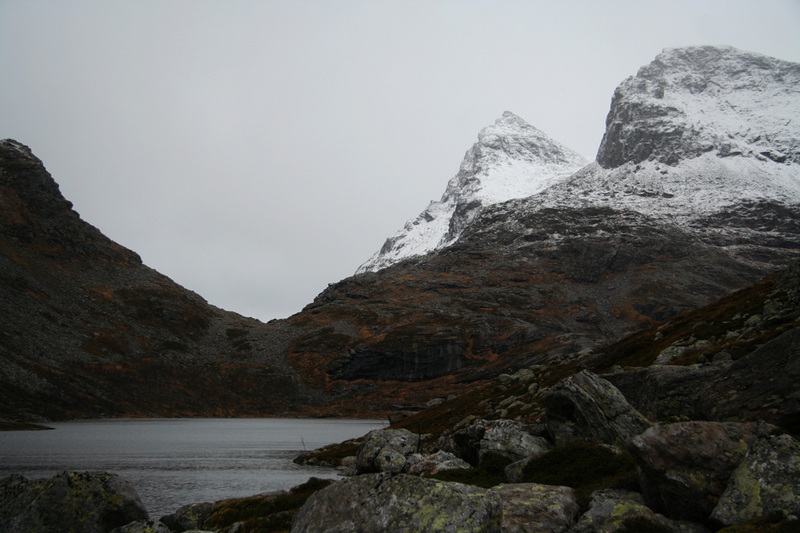 By now I had realized that Breidviktinden was not on my primary list of hiking goals, however with a prominence of 764 meter, still a very interesting objective in an area of Norway where I had never climbed any mountains before. I arrived late Friday afternoon and booked into hotel Skagen in downtown Bodø. This hotel can be highly recommended, friendly people, great service and reasonable rates. The weatherforecast called for a chance of reasonable conditions (it was stormy when I arrived) on Saturday morning, then more rain, snow and wind later in the day and on Sunday. We agreed to meet at the trailhead at 0800, as it turned out 0700 would have been better. At 0800, daylight was coming and we did not need to use our headlamps as we started hiking. We walked at a pretty good pace in terrain dominated by lakes and meadows with somewhat steep cliffs blocking easy passage between them. It is late fall in arctic Norway. The meadows are soaked with water. Every step sinks into a mix of old grass and water, lots of water everywhere. The trees are without leaves, dropped months ago. There should have been snow by now, but the climate stays milder longer than normal. Signs of a global warming trend? The mountains rise steeply into the clouds. They are white near the summits, they look steep and alpine extending their slopes from sea to the sky. There are no signs of life, the birds are gone, the few mammals that live here stay out of sight. Only three small humans, dressed for harsh conditions, walking into the wilderness. Our goal Breidviktinden is higher than the hostile looking mountains ahead. It will not come into view until we are much further ahead. It is completely overcast, but no rain and almost no wind. 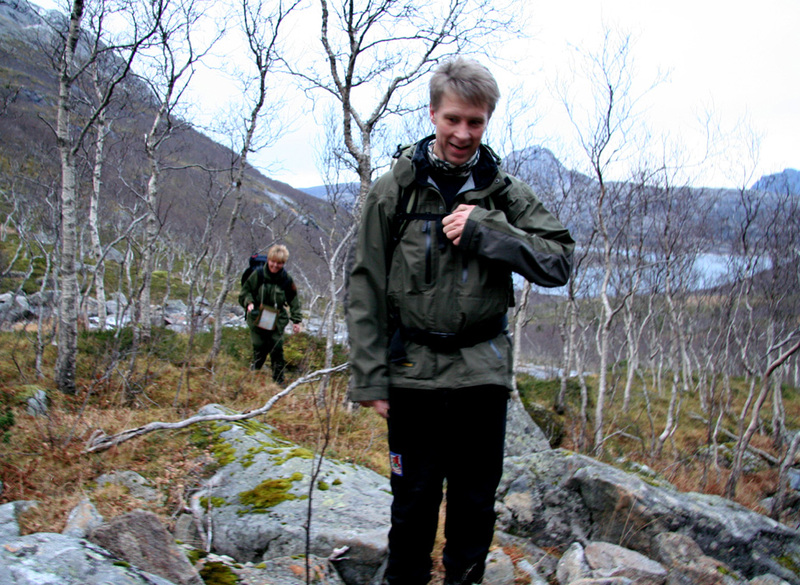 The terrain got more serious as we left the trail near Tømmervika and made it across to the Storvika beach. Here, we start out to climb a more than 1150 meter tall mountain and after hiking for about 1.5 hours we walk along a beach at elevation 0 meter! 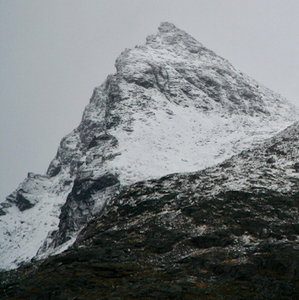 Welcome to mountain climbing in Nordland. The terrain was now quite good and we made our first short stop at the outlet of lake Storejuvvatnet, elevation 335 meter, at 1100, 3 hours of steady walking. Here, a light snowshower started as we entered Breidvikskardet and noticed an extremely nice echo across this narrow valley. Unfortunately, Therese started getting cramps in her legs and decided to turn around at about 760 meter. We had noticed slower progress and I realized that a substantial part of our return hike would be after dark. Therese most likely kept an eye on her watch as well and may have decided that by turning around here, she would help us make the summit. She had her own GPS with tracks and was used to hiking in the mountains so she wished us well and started the long hike back. 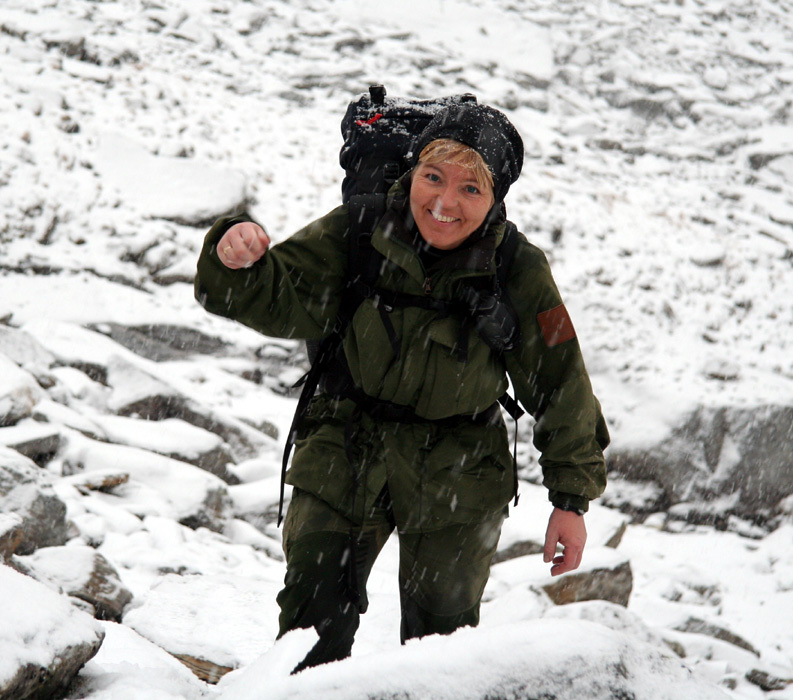 Strong and experienced, we realized that she would do fine on her solo return hike. Many thanks to Therese for good company and for her good judgements. From this point, the snow got considerably deeper and the rocks deep under the snow had a thin layer of ice. This set the stage for a continuous struggle. 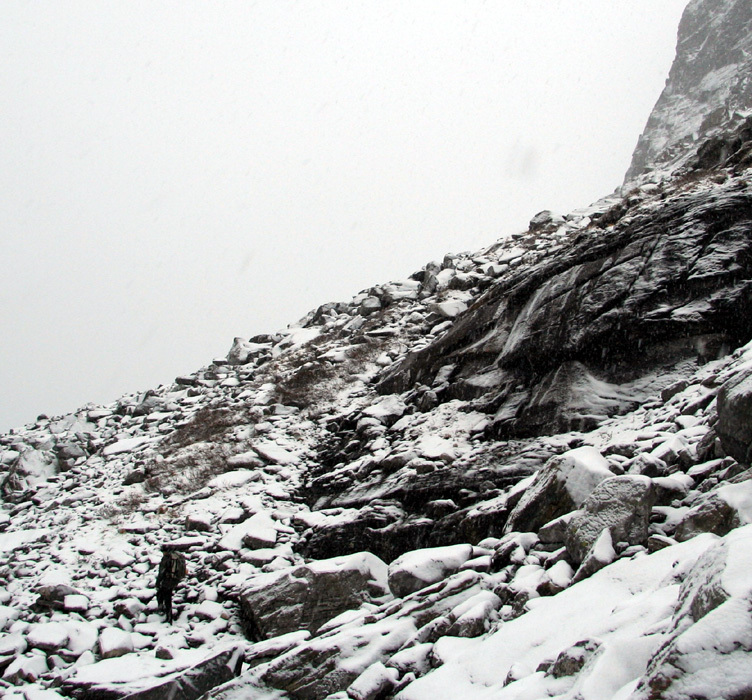 First, into the snow to your knees, then slip and slide on the hidden rocks below. We took turns breaking trail, a pretty exhausting occupation. Finally, I made the main ridge and realized that the summit was within sight. We reached the cairn at 1330, 5.5 hours from the car. It is still snowing, too bad we have absolutely no views. The views from up here must be phenomenal on a clear day. The slope to the north-west looks overhanging, all we can see is a jagged line of rock, then white air. 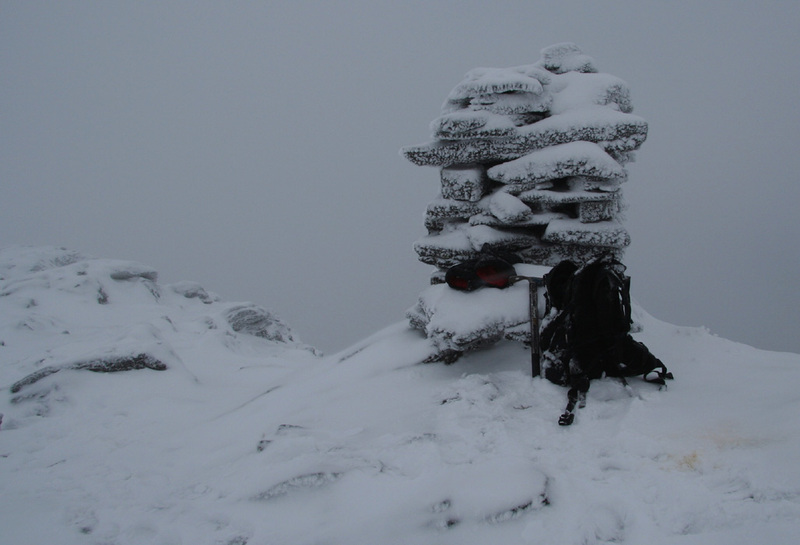 The cairn stays close to the void, however, a rocky point about 5 meter further along the ridge looks like it may be marginaly higher. I walk over and take a picture back to the cairn. A brief stop, then start the descent. We wanted to at least be off the steeper part before it got dark. The descent went well and we made it back to the outlet of lake Storejuvvatnet before it got so dark that walking became difficult. I was very unhappy with myself having brought along a small headlamp instead of the big one that I left behind in my hotel room in Bodø, thinking that night hiking would at most be a short return hike along a reasonable trail. No such thing, 3 full hours of night hiking, first completely off-trail including the downclimb along "the ramp" to Tømmervika, then still quite rugged terrain. My light was a joke, suitable for reading and perhaps looking at a map, but useless for the purpose to avoid walking straight into deep waterholes or stepping on slippery rocks. Fortunately, Dag had a heavy duty halogen lamp and enough patience to make me take advantage of his light as well. Thanks to him progress was not too bad, but the extra effort needed to avoid trouble while largely placing my boots in complete darkness made me more tired towards the end of this hike than I have been in quite a while. We arrived back at the car at 1900, precisely 5.5 hours also on the return. The uphill struggle in deep snow was in this sense equivalent to the extra time spent wandering in darkness for 3 hours. Unfortunately, Dag told me that his knees were "totally gone" and probably would look pretty bad as soon as he got home. There was no way he could even contemplate another hike to Eidetinden on Sunday. I finished off the day with a gourmet dinner at "Svendgård's" a restaurant with excellent food, another strong recommendation for anyone visiting Bodø. I started to accept that there would be no Sunday hike as I would not be able to organize transportation including an early ferry reservation the next morning. The fact that the weatherforcast for Sunday was really bad served as an additional excuse. The next morning, however, I looked out at the best weather since my arrival. There were even patches of blue sky. The weather stayed nice until about 1300, long enough for me to have completed Eidetinden if planning had been different. Thanks again to Therese and Dag for a most memorable hike to a remote peak that receives few visits. In fact, climbing it in November may be highly unusual since full winter would be the normal situation at this time of year. Breidviktinden, as seen from Storejuvvatnet. Therese and Dag, our long November hike is underway. Storvika Beach. We have reached 0 meter above sealevel. Sørfjorden, the view just right of the previous picture. Breidviktinden, our first view after 3 hours on the approach hike. Beginning the ascent, Dag is finding his way among slippery boulders. A smiling Therese. Despite slippery rocks and painful muscles, just before turning.